Staffs Police reach 5,000 followers, expect pat on the back for not engaging. Brilliant. Good for them. It’d help if they actually engaged though on those social media sites. Or maybe the force is socially inept as an organisation. I actually went through all of @StaffsPolice‘s 1,463 tweets. I found 21 replies (though I may have missed some). 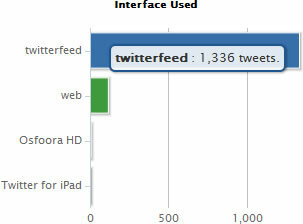 After running the account through TweetStats I was given the figure of 1.3% of total tweets were replies. That’s 19 if I’ve done my maths right. Over 90% of their tweets are completed automated, generated from an RSS feed with no input from an actual Police officer or employee. There is some good news though – they have a few manned Twitter accounts which are working on a more community level which you can see in action on the Twitter list. This is a funny one! Or at least, it made me chuckle before I got annoyed by it… The force’s Facebook page has 1,027 “fans” (or whatever Facebook is calling them this week). Across all of our social media sites we have 5,000 followers! Are you likely to engage more with Staffordshire Police because of Facebook and Twitter than you would if these weren’t available? Please post your comments below. Andy Bennetts: Are you going to engage with the public through social media? It doesn’t look like it so far. Your various social networking accounts are a one way conveyor of ideas and information. There’s no conversation going on. You post links etc. people comment and that’s that. Doesn’t look like engagement to me. Andy Bennetts: Just like that. Andrew Fox: MegaLolz.. Thankyou for you engagement. And then there’s the forum discussion they started asking how they’re doing. No replies; maybe they should take that as a hint. Once again the Facebook page is mostly made up of automated postings from an RSS feed using an app called RSS Graffiti – no human involvement. Honestly, I’ve got better things to do. I’d like to make this a sort of open request to Staffordshire Police: please get better. Go and ask Nick Keane and other forces for lessons in doing this right.